If you want to experience real Appalachian old-time square dancing, the West Virginia State Folk Festival is the place to be. Dances are held on the large platform on Court Street between United Bank and City Square Park, and begin at 8:00 on Thursday, Friday, and Saturday nights. 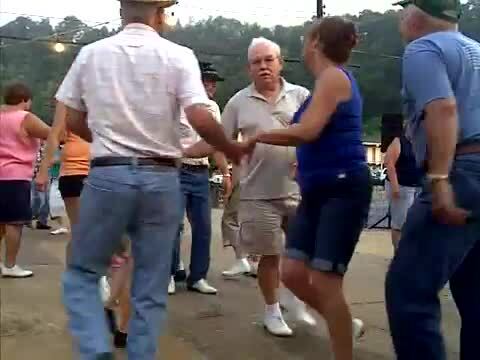 Dance bands vary somewhat from year to year, but are formed with some of the best West Virginia dance fiddlers such as Dave Bing, Gerry Milnes, Jesse Milnes, Tracy Schwarz, and Bobby Taylor among the ones playing in recent years. Callers include Mack Samples, Bill Oshe, Ken Turley, Linda Donohew, Taylor Runner, and others. Beginning in the fall of 2012, the West Virginia State Folk Festival began having dances at the former skating rink, presently the 33 Country Club. Owner Karen Shackleford generously donated the dance floor, and the same musicians who play the dances at the Folk Festival are playing for these dances. The first dance was held in November, and as many as five sets were on the floor for some of the dances. A second dance was held January 17th, and in spite of snow, there were still three sets most of the night. Be sure to join the WV State Folk Festival Facebook Group to receive notices of when the next Square Dance Night will be. Each year the Dance Platform is constructed (and deconstructed) on site by many wonderful volunteers.